It seemed like every store I walked into had blue-striped shirts. I walked into the Gap and fell in love with this cool blue one-shoulder ruffle top. I am not a big fan of off the shoulder blouses, I personally find them a bit uncomfortable. Every time I have worn off the shoulder shirts for one reason or another they end up on my shoulders. Anyways what I liked about this blouse is that its one-shoulder, so its super comfortable. As I was browsing the store I checked out the baby section and found this adorable Print embroidery bell dress for Sabrina. It might be cliché but I absolutely find it so adorable when I see mommy and me matching outfits. So when I saw this dress I didn’t hesitate on buying it. 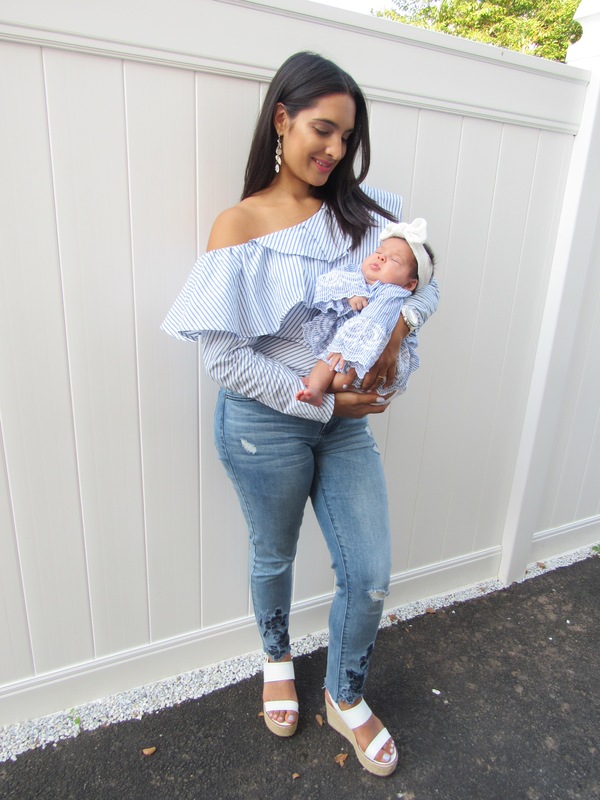 I love matching prints with my baby girl. 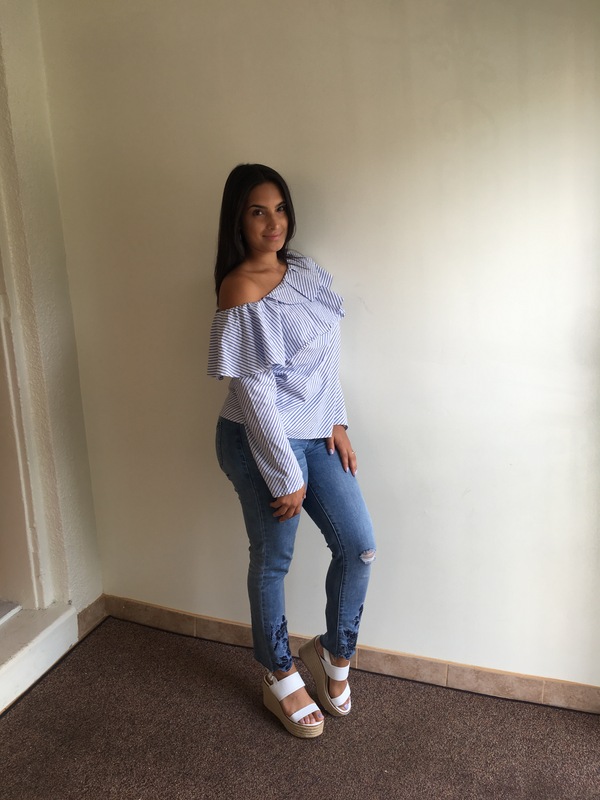 I paired the top with these super cute pair of jeans from celebrity pink. I not only loved how the fit but what sold me was the embroidery on the jeans. 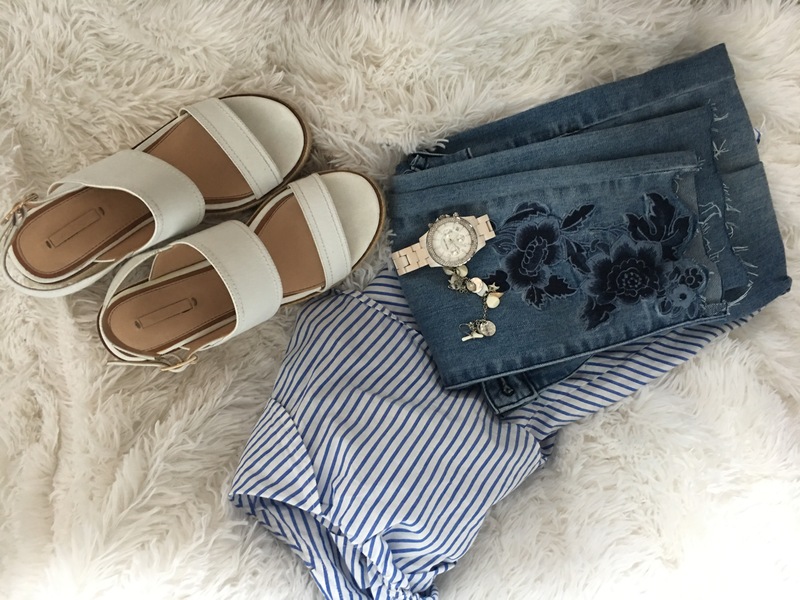 My wedges are from Aldo, I bought them last summer and they are my absolute favorite. Sabrina is currently 2 months old. She is such a good baby, she likes to sleep all night and day lol. She loves to go out with mommy. She behaves so well when we go shopping.